HIV prevalence which represents published national prevalence rate according to Statistics South Africa Mid-year population estimates 2013. Human capital data is based on Group and Divisional payroll data. HIV prevalence is based on Healthy Choices VCT testing figures. Due to the large number and geographical positioning of stores, testing is not conducted at all stores every year. HIV prevalence is based on staff tested in a particular year. Data is internally audited prior to publication. 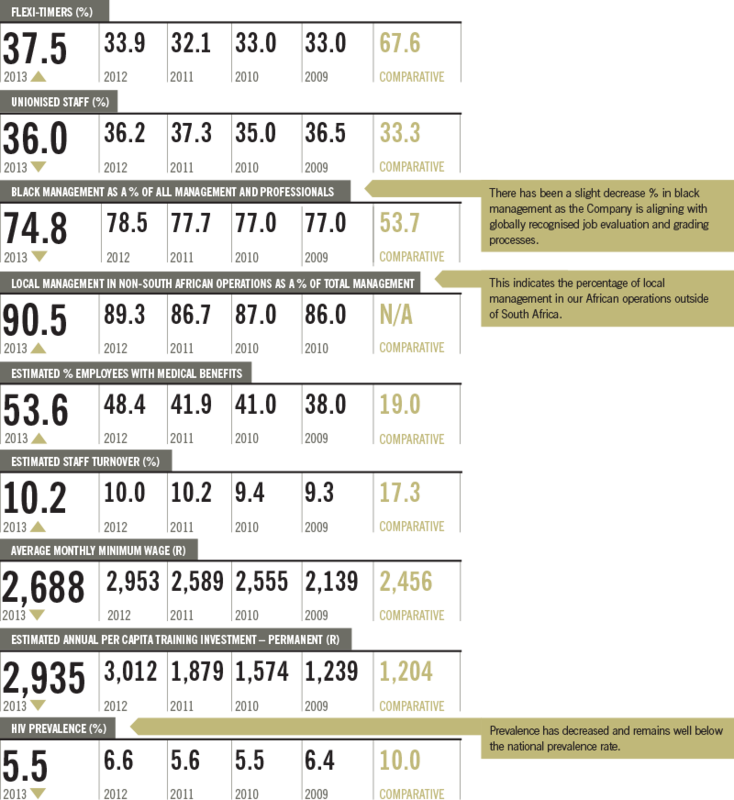 Comparative data represents the best performance in the Retail Sector as published in the Empowerdex EEC Survey 2013. (%) Indicates percentage score achieved on the B-BBEE scorecard. 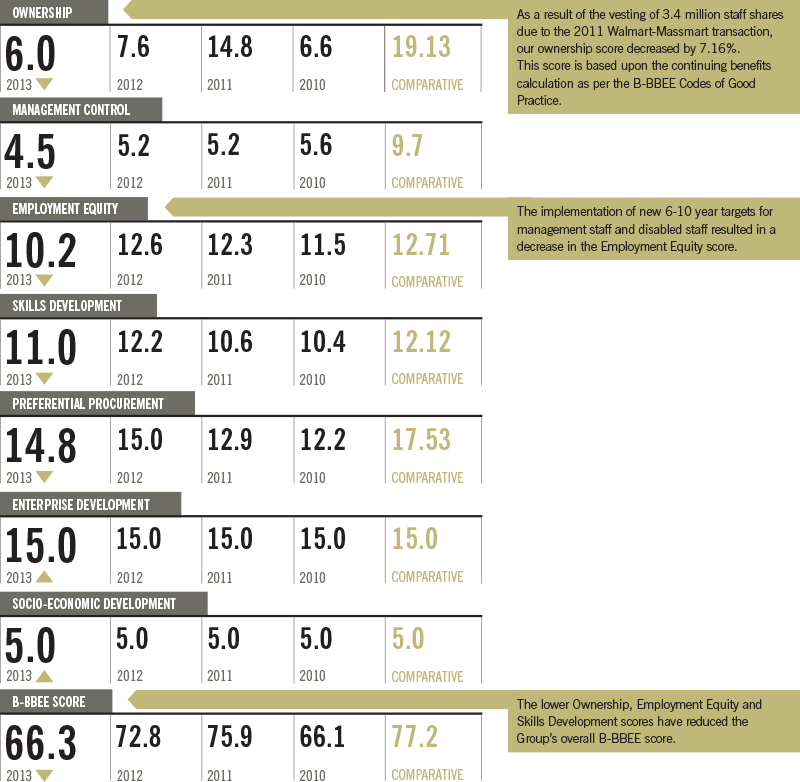 Massmart’s B-BBEE figures are calculated externally by Empowerdex Economic Empowerment Rating Agency. These figures are based on actual staff numbers (not estimates). B-BBEE scores are calculated retrospectively, therefore the data reported is based on the scorecard complied in February 2013 for the period January – December 2012. CSI data is based on actual Group expenditure figures which have been internally audited. Government beneficiaries include the Department of Basic Education, the South African National Defence Force and the South African Police Service. Support is provided through the provision of school container kitchens, school building and infrastructure maintenance, library containers, food hampers and assistance with service delivery. Investment in feeding schemes includes spend on container kitchens, vegetable gardens, NGO and government feeding schemes and Foodbank contributions. Investment in Early Childhood Development (ECD) includes Game’s Tools 2 Play ECD kits and Tools 2 Teach stationary hampers, as well as Makro’s contributions to ECD partners such as HOPE Worldwide. Investment in infrastructure and school maintenance is primarily based on a Builders Warehouse project that provides schools with equipment and supplies for basic repair and maintenance. Investment in discretionary projects includes donations to Community Chest, Vodacom Wheelchair Fund and ad hoc requests. 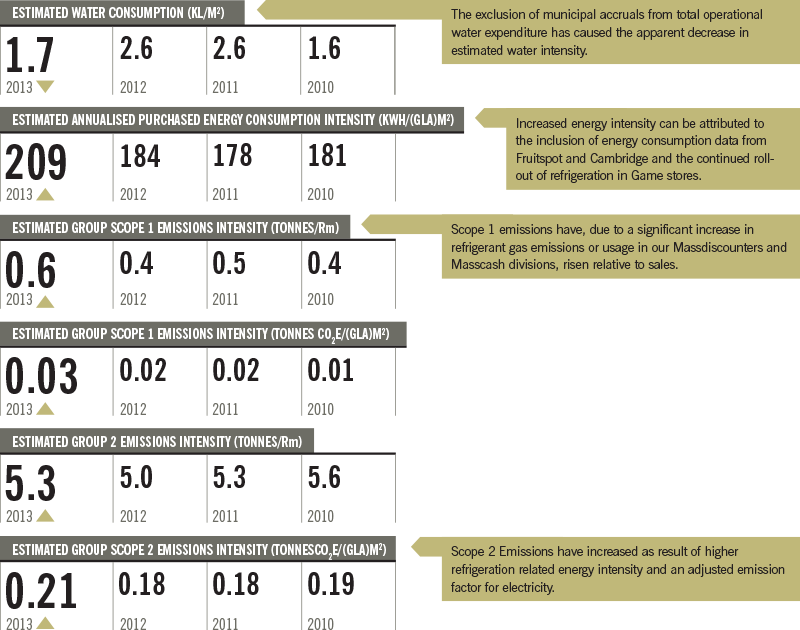 Scope 1 and 2 emissions figures are calculated externally by GCX Africa consultants. Scope 1 emissions relate to direct emissions resulting from Company-owned vehicles, generator use and refrigerant gas emissions. Scope 2 figures are based on Divisional electricity consumption figures. Energy consumption data is annualised and normalised (outlying data is excluded). Consequently the margin of error on reported data is considered to between 10% – 15%. Electricity consumption and Scope 2 emissions figures include Masscash African operations but exclude divisional Distribution Centres and Head Offices. This year emissions data for Cambridge stores and Fruitspot were included in the calculation. Scope 2 emissions factor has been updated from 0.99 to 1.00. 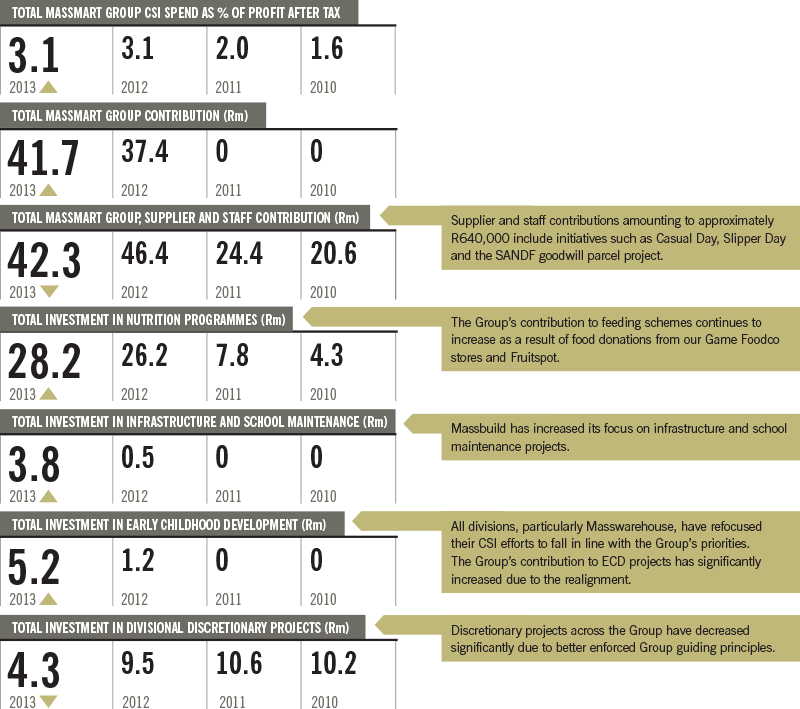 The total Group sales are used to calculate Scope 1 and 2 emissions’ intensity per Rand million (Rm). Water usage has been derived with reference to the cost of water consumed. Water consumption is based on Rand Water Tariff for retail customers. 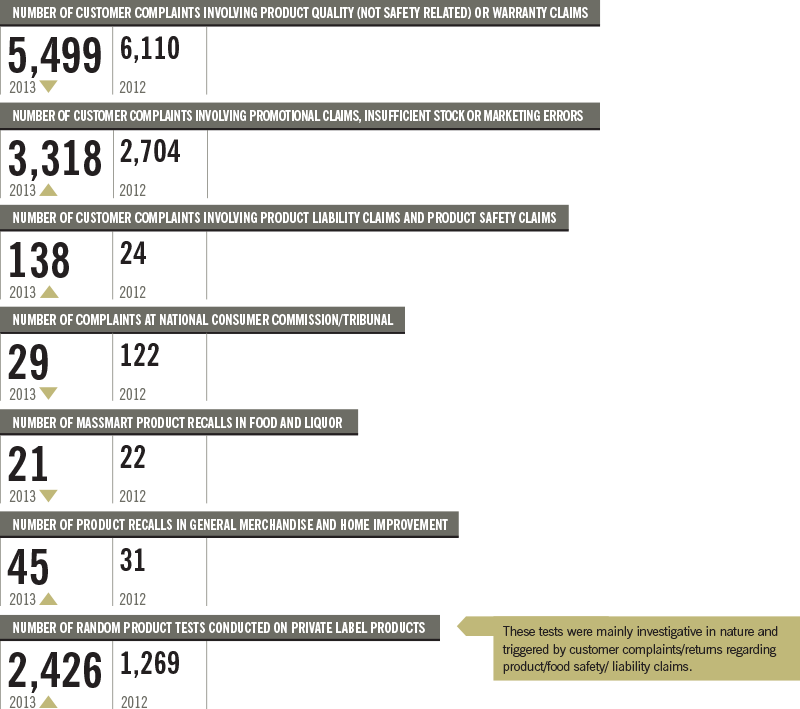 Customer complaints refer to those logged through the central complaints system and exclude those at stores which are resolved immediately at the store.